There were two writers named Marianus Scotus: they were both born in Ireland in the 11th century, and both spent much of their lives in Germany. The one who wrote the chronicle in this manuscript was born in 1028 and died at Mainz in 1082. His chronicle extends from Christ, until 1082. 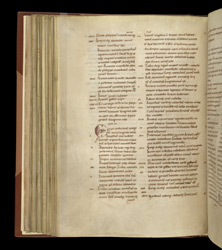 This manuscript was probably written at Mainz, but was at Hereford in the late 11th century, and was probably given to the cathedral by Robert of Lotharingia, bishop of Hereford (1079-1095). Most of the coloured initials in this manuscript are rather plain, or have simple embellishment. Some, however, like the 'E' on this page, incorporate a human face.